The Undertakers (Episode 03-02, October 1963). The Undertakers is a new kind of episode for The Avengers: one which hints at the slightly madder plots that would be forthcoming into the later seasons. A similar plot will be played out in the Emma Peel episode The Gravediggers, only with a bit more of a spy-fi edge. Think of The Undertakers as a more down to earth version of that increasingly weird little episode. The Undertakers is also one of the few episodes that have Steed and Cathy stumbling onto a plot almost by accident. Steed has been assigned to accompany one Professor Renter to America; Renter has “solved the problem of high-speed industrial film,” as the episode informs us more than once, and is heading to America to negotiate for patents, or something to the effect. But when Steed shows up at Renter’s flat, he’s informed by the hilariously flighty Mrs. Renter (Lally Bowers) that the Professor has “gone into retirement” without warning and cannot be contacted. Steed smells a rat and soon discovers that quite a number of millionaires have “gone into retirement” at the same shady community in Adelphi Park. He ropes Cathy in to help out with the investigation, uncovering a dastardly but rather clever little plot involving a funeral home and tax evasion. The Undertakers has a breezy madness about it often missing from the more serious endeavors of the Cathy Gale seasons. Much of this is the result of Mrs. Renter, who is so apparently daft yet clever that she exasperates Steed within a few seconds of meeting her. There’s an organized crime subplot involving Mrs. Renter’s next door neighbors a bit more in keeping with the noir-ish aspects of the early seasons, highlighting the fact that The Avengers really did trade on stereotypes and unsubtle characterization outside of its leads. But even that cannot take away from the fun of the episode, or the visible enjoyment that Macnee and Blackman are getting out of it. The final outdoor chase sequence makes even some of the more ridiculous twists of the plot worthwhile. 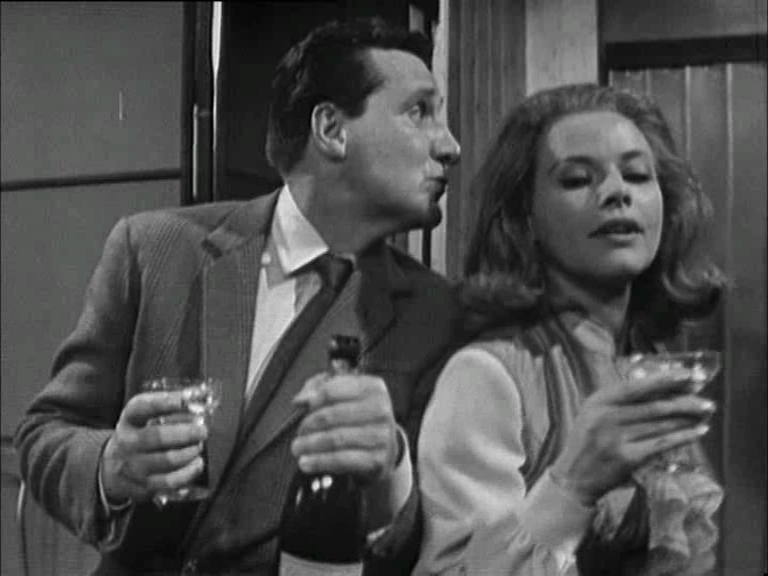 As the relationship between Steed and Cathy goes through its ups and downs, here we see a rather warm domestic connection developing between the pair. Steed shows up at Cathy’s apartment to drop off some things from his pantry in preparation for his departure. As Cathy prowls around cleaning a set of pretty massive guns (why we are never quite sure), Steed attempts to engage her in conversation, telling her how much he’ll miss her and how he’d rather take her along on the ocean voyage. It’s an adorable little scene, augmented later by a visibly intoxicated Steed putting the moves on Cathy in a somewhat unexpected manner. All in all The Undertakers is just plain fun – it doesn’t drag, the cast is enjoyable without overwhelming the plot, and the plot itself as clever as you can get from this season.